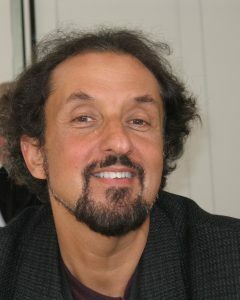 Roland Legiardi-Laura is a filmmaker and poet. His documentary Azul, a study of Nicaragua’s people and history through their poetry, won nine international film awards and three ACE nominations. Mr. Legiardi-Laura’s poetry has been widely published and anthologized. He founded Words To Go and P.O.E.T., America’s first traveling troupes of performance poets. He serves on the Board of Directors of The Nuyorican Poets Cafe, and founder of its Fifth Night Screenplay Reading and Short Film series. Over the past five years The Fifth Night has produced 190 screenplay readings. Thirty-six of those screenplays have already been made or are currently in production. He is the editor of Poetry-in-Translation at Bomb. He has been a nominator for the Rockefeller Media Arts Program. Mr. Legiardi-Laura has served as a member of the Board of Governors of the New York Foundation of the Arts. He has been awarded numerous grants and fellowships from the New York State Council on the Arts, NYFA, the New York City Department of Cultural Affairs, the Rockefeller Foundation and the Andy Warhol Foundation for the Arts. He is on the board of Advisors of the Nantucket Film Festival, the New York Comedy Film Festival and the East Village Parks Conservancy. Legiardi-Laura’s current documentary film project is a three-part series entitled The Fourth Purpose: The Enigma of Public School. Roland has worked over the years in his home community, the East Village, as a board member of the East Village Parks Conservancy and the East Village Community Coalition to preserve its artistic diversity, immigrant and working class history and its architectural heritage.